It’s ten o’clock in the morning of a long weekend, and Kerri’s home is filled with the sound of her four exuberant, clamoring grandchildren. This is bliss to her and the best part of her three-year sobriety from two decades of opioid addiction. Kerri was prescribed prescription painkillers when she was 16 and having back problems. At first, she took the opioids for the pain, but gradually began to take more, adding alcohol to the mix. The pills blunted the physical pain, and on a deeper level, masked the trauma of sexual abuse she experienced. Kerri had five children by the age of 21. At the peak of her addiction, her kids were taken from her by social service officials in Lethbridge. The same van also stopped by her sister’s homes, and in the space of an hour, all of their children were removed and placed in foster homes. Kerri continued to use painkillers, graduating to stronger doses of oxycontin. She sold drugs and never considered herself to be addicted to drugs, like her customers. “I just thought I liked to party,” she recalls. Her children kept running away from their foster homes and she would hide them in hotel rooms. Two years later, they were returned to her, while she was in full addiction, dealing drugs. She was enmeshed in an abusive relationship and facing jail time. She applied to the Calgary Drug Treatment Court, where part of her admission was to have no contact with her partner of 18 years, who had been part of her addictive lifestyle. Even more difficult was the scarcity of treatment beds for women applicants to the program. That meant an extra six weeks in jail, while she waited for a place. 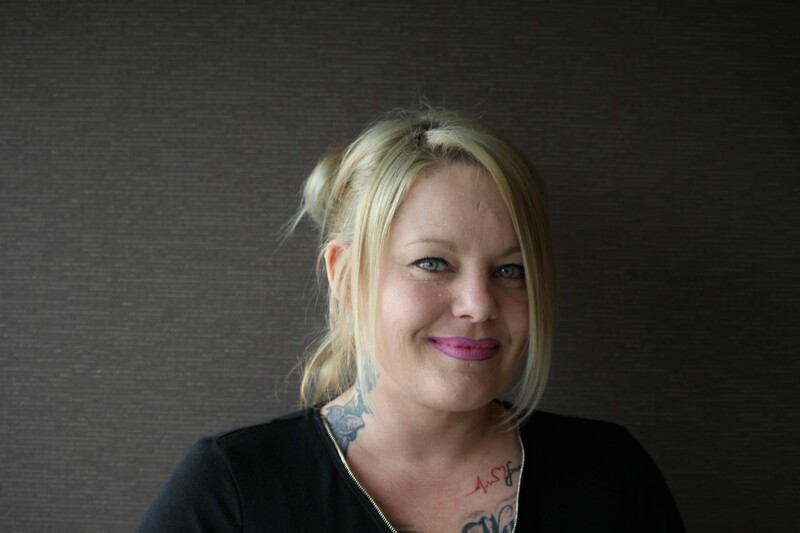 Kerri credits the Calgary Drug Treatment Court for “literally going through every aspect of my life to learn how to live again.” The program was difficult but thorough. She was referred to a therapist to help her cope with the anxiety and trauma of her childhood. Her sisters have not fared as well: both are lost in addiction in Vancouver’s Downtown Eastside. Unlike Kerri, they never got their children back. This haunts her and she’s made a point to find and re-connect with each one of those lost nieces and nephews in Lethbridge. Today, Kerri is in a healthy relationship with a man who went through the drug treatment court with her. She is taking a book-keeping course. One grandchild lives full-time with her. After an eighteen-year separation from her father, she is now reunited with him. She laughs as she recalls the reception of her Mormon relatives to her, “covered head to toe in tattoos.” They have all learned to adjust and enjoy each other.